Skip the luxury resorts and 5-star hotels in lieu of finding a deeper connection with the nature that people flock to the Quirimbas Archipelago to experience. Combine sailing trips on traditional dhow boats over the Indian Ocean with sea kayaking in the mangroves, stopping to snorkel off the coast of uninhabited islands, eat freshly caught seafood cooked over an open flame, and sleep under the stars. Skip the luxury hotels and 5-star resorts in lieu of connecting with the natural habitats that attract visitors from around the world to the Quirimbas Archipelago off the coast of Mozambique. Combine sailing safaris on traditional dhow boats with sea kayaking through mangrove forests and past white sand beaches. Stop to snorkel off the coast of uninhibited tropical islands, sleep under the stars, and enjoy freshly caught seafood cooked over an open fire on this tour that provides the best of natural attractions and luxurious travel. 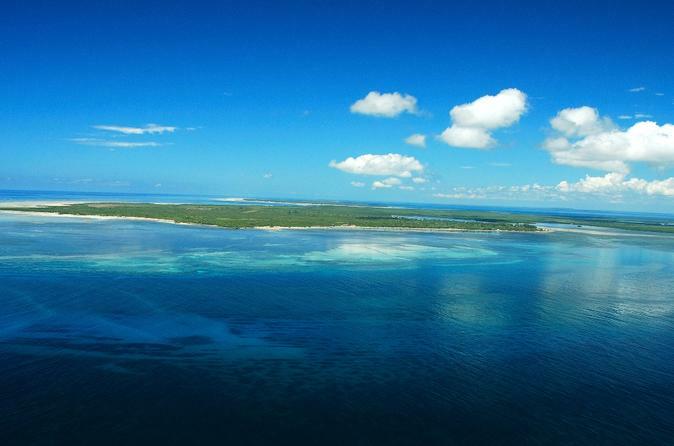 A beautiful light aircraft flight over the islands and turquoise waters transfers you from Pemba International Airport to Ibo Island Lodge. Probably the most compelling attraction in the Quirimbas, Ibo's 200-year-old ghost town and 16th Century forts make for a fascinating journey to an era long forgotten. The Ibo Island guided Experience (included) provides a chance to interact with the amazingly friendly local people and observe their unique island culture and heritage and a way of life that has not changed for hundreds of years. Wander around the mysterious ruins amongst forts and ancient trade buildings with many fascinating stories just waiting to be told. You will have ample time at magical Ibo to explore after the dhow safari as the safari returns to Ibo for days 6 and 7 of the itinerary. Depart Ibo Island for your exploration north into the Quirimbas Archipelago! Sail into the clearest of blue water with pristine corals below to explore under snorkel. Turquoise clear waters and beautiful scenery awaits you en route, in the afternoon, take a tour through this fishing village getting to know the ways of these fisher folk as interpreted by your knowledgeable guide. We will stop on the southern tip of Matemo Island and explore this part of the island. The beautiful Ulumbwa river mouth beckons and it is here where fascinating rural fishing villages dot the shore. Enjoy an early morning sail up the Ulumbwa estuary viewing a variety of birds & mangroves that thrive in this area. You return to your beautiful beach camp set up under the palms on the shores of Matemo Island with enough time to explore Matemo, take a walk of swim. Mogundula Island and her surrounds is one of the best islands in the archipelago which is why you spend 2 nights here giving you a fantastic base from which to explore. Known by the locals as the island with the sacred lake it provides us with beautiful bird watching, pristine swimming off the sandbank beach and excellent snorkelling. Your mobile camp is set under the shade of trees and you usually have this magical uninhabited island to yourself! Overnight camp and exploring on Mogundula Island and surrounds. Day trip by dhow to the Pangane Peninsula or similar and/or Macaloe Island from camp. The emphasis at Ibo Island Lodge is a mix between guided activities and relaxation and a base from which to explore fascinating Ibo Island. Partake in guided historical and cultural tours offering outstanding photographic opportunities, wander around the stone town and ruins and wonder how did this all come to be here so far away from the outside world. Relax at one of the pools and order ones of Kissingers cocktails, and book a massage for the ultimate island pamper. Marine based optional activities are also available at Ibo – a full PADI dive centre, sea kayaking, snorkeling and the most popular of all our dolphin encounter safaris.